Kareem Abdul-Jabbar is a member of the NBA 35th and 50th Anniversary All-Time Teams, a Hall of Famer and was named a Top 50 All-Time player. 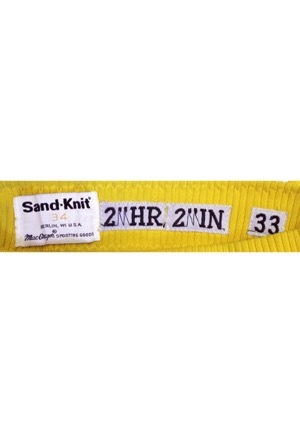 In the rear waistband is the Sand-Knit manufacturer’s tag size “34”. 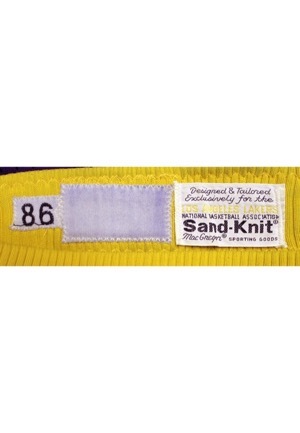 To the left are three additional tags reading, “Designed & Tailored Exclusively for the LOS ANGELES LAKERS”, a blank tag, and a box tag reading the year “86”. To the right are also three additional tags reading “2” HR”, “2” IN” and “33”. There is team piping down the sides and on the bottom right leg is an official “NBA” logo embroidered. 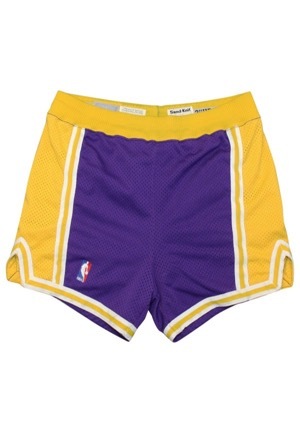 These shorts are properly tagged, were presented to us as game-used and show outstanding use.